As you drive into Havana from JosÃ© MartÃ­ International Airport, you are struck with billboards — not for perfume or cola drinks, but celebrating the 52nd anniversary of the Cuban Revolution. Some of the billboards are aimed at U.S. “imperialism” and in particular the embargo that has hurt Cuba’s economy. 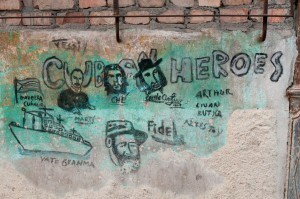 Surprisingly, the icon reflected most is not the Castro brothers, but rather Che Guevara, an Argentinian who died in Bolivia in 1967. This graffiti in Centro Habana is a cruder variation on the slicker billboards.